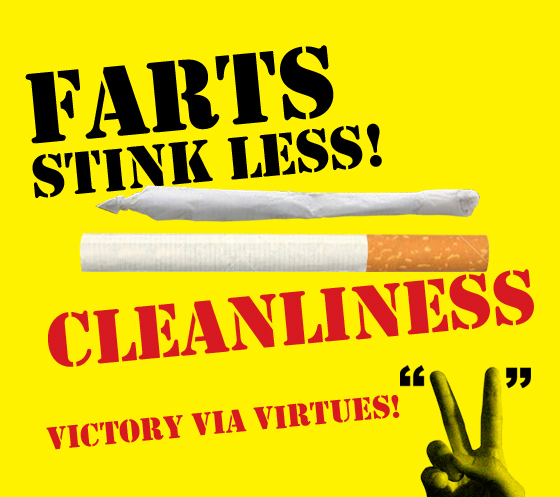 Let’s tell our kids that cigarettes and pot stink! One way they can rise above the temptation is by understanding the virtue of cleanliness. Cleanliness means more than washing often, keeping your body clean, and wearing clean clothes. Cleanliness can be in your mind as well as your body. A clean mind means that you keep your thoughts on things that are good for you. You can “clean up your act” by deciding to change when you have done something you aren’t proud of or made a mistake. Staying clean also means keeping you body free of alcohol, tobacco and harmful drugs. When you practice cleanliness you feel (and smell!) fresh. Keeping yourself clean makes you nice to be around. Cleanliness protects you from disease. Washing your hands before you eat and after you go to the bathroom keeps away germs that cause disease. When a room is clean and orderly, your mind feels clean and uncluttered too. A clean mind keeps you feeling peaceful. Cleanliness is washing often and brushing your teeth. It is putting things away after you use them and keeping things in order. If you make a mistake, clean it up. Make amends and then act differently. Avoid looking at, listening to, or eating things that harm you. Only put into your body and your mind things that make you healthy. You choose to be Above the Influence.